In this crazy world of novels composed on cell phones and short stories posted on Twitter, flash fiction is all the rage. When done well, flash fiction can offer refreshing glimpses into a story, insights that seem all the more precious for their conciseness. 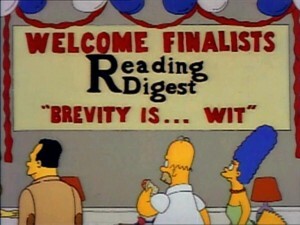 When done poorly, however, the story seems unfinished and empty, almost lazy, with merely the promise of plot. 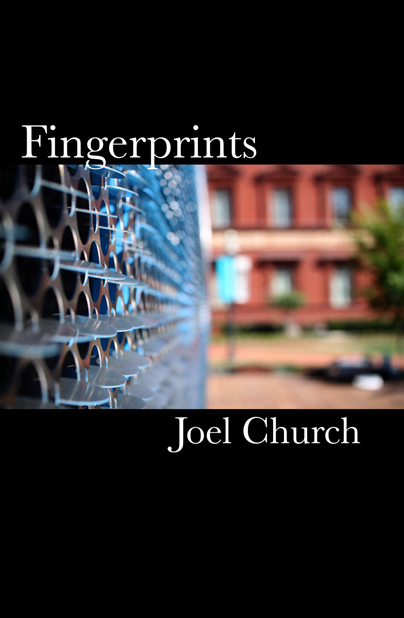 Fingerprints, Joel Church’s first collection of flash fiction, captures both the enticing and the mundane. Set against the backdrop of Washington, D.C., Church’s characters explore topics ranging from sexuality and drug abuse to childhood and loss. These stories extend from two to ten pages long, and their brevity makes them an excellent read on the metro; I could read for only one or two stops and not feel completely lost the next time I opened the book. D.C. is prominent throughout the stories, not only as a venue, but also almost as a character itself that appears in the background—a familiar friend. “Polly’s cafe,” the story of a U St. landmark and hip hangout, is one good example, but many other neighborhoods are mentioned: Dupont, Foggy Bottom, and Columbia Heights, to name a few. The Simpsons, "Mr. Lisa Goes to Washington"
It surprised me that, in a collection of stories that focused quite a bit on young and middle-aged adults, some of the collection’s shining stars are the stories about kids. In “Joes,” the anguish and joy of childhood are displayed wonderfully, and “Lemonade, Inc.” is precocious and charming. But the collection touches on many more grown-up issues as well. I was touched by the poignancy of two lonely people with such an unexpected relationship in “Father of the Year,” and the premise of “The Beloved Chad Fairwell” was interesting and creative; I would have liked to see the author put his imagination to use in more stories like this one. Unfortunately, other parts of the collection were more disappointing. Everyone on the fringes of a social circle has imagined the fates of the dense jocks and self-important beauty queens that ruled high school. But several stories are sprinkled with clichés and the judgments from the narrator, and straddle the line of revenge fantasy just a little too much. Sometimes the author does too much telling and not enough showing, with easy, flat truisms that distance the reader from the narrator, rather than inspiring empathy. However, I was most bothered by the lack of compelling female characters. Nearly every woman mentioned is a victim: of desire or pity at best, but of violence and contempt at worst. Many of the women are portrayed as materialistic, desperate, vapid, and lacking in confidence, self-esteem, and self-control. Though some of the men also seem overtly pathetic, there are just as many well-rounded and healthy male characters to be found—from the quiet, shy guy in a band to the hopeful young boy playing with his G.I. Joes. Moreover, almost every story in first-person perspective is narrated by a male, and their surprisingly constant chauvinism makes many of the stories blend together. If being an insensitive jerk is the stance that most characters take, perhaps the stories would be better suited as long short-stories or even a novella that would combine the similar elements of all of the stories. I expect from flash fiction wide viewpoints, plots, and characters—the flexibility of the genre is one of its strengths. Of course, I’m also not saying that having an insensitive jerk as a main character is necessarily a bad thing. Everyone has felt the enigmatic pull of characters such as Tyler Durden and Holden Caulfield, and seeing the world through the eyes of someone else always has its advantages. However, stories that prominently feature inequality among characters—be it economic, racial, sexual, professional, or anything else that puts one character in a position of power over another—must also have at least a hint of self-awareness. The male narrators do not seem to realize that the women in the stories are mistreated, so no commentary is made upon their victimization. While I always enjoy reading about the “real” D.C. (and not the one that no one watched on MTV, either), I found the weaknesses of some of the stories to be off-putting. However, I applaud the author for his innovative use of the flash-fiction form, and I would like to see more inventive yet refined stories from him. Joel Church is a lifelong resident of the Washington, D.C., area. In addition to his fiction, he is also an abstract artist. I picked this gem up at Politics & Prose recently and was delighted to find a local author that is not oozing with political intrigue. Church’s stories are pointed and entertaining–and indeed just the right length for a metro commute. I enjoyed the book and look forward to another contribution from the author, as well.